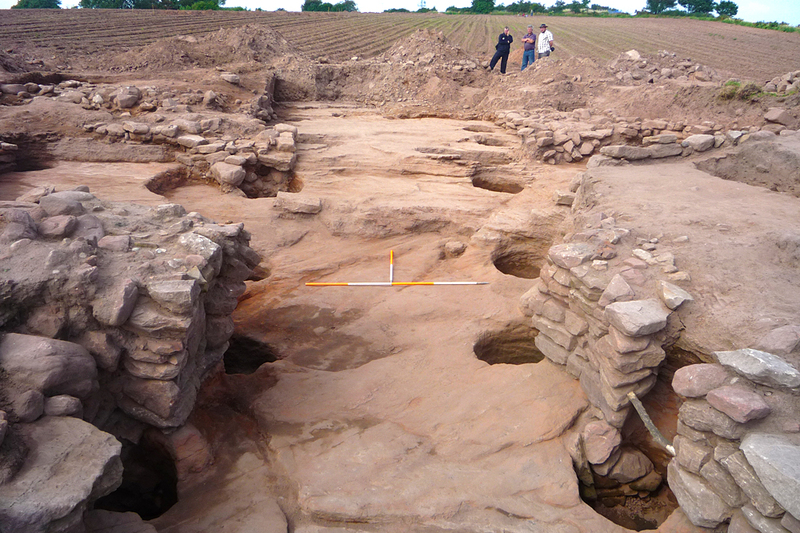 Defended settlements called hillforts sprang up along Cheshire’s sandstone ridge as the climate deteriorated during the late Bronze Age/early Iron Age, some 3000 years ago. Population growth combined with the spread of new iron weapons made it a dangerous time to be alive. The old ritual hilltop enclosures seem to have been gradually fortified, as times changed. Earthworks topped with wooden palisades surrounded groups of thatched round houses, storage huts and animal pens. Hillforts along the mid-Cheshire ridge include those at Woodhouse, Eddisbury, Kelsborrow, Beeston, and Maiden Castle. Other defended settlements occur nearby on Helsby Hill, Oakmere, and at Bradley above the River Weaver. Current thinking suggests the hilltops were probably first enclosed in the Neolithic, around 6,000 years ago, to mark them out as special places. By the late Bronze and early Iron Age these hilltop enclosures had become increasingly defensive, possibly to protect and regulate important goods such as salt, grain and livestock. Evidence supports the idea that many ‘hillforts’ were abandoned as society changed in the middle to late Iron Age. A few, such as those at Eddisbury and Beeston were later built over or refortified in historical times to make the most of their strategic positions. But whatever their purpose in the distant past, the hillforts along the Sandstone Ridge are an essential part of the Cheshire landscape today. Along with Roman roads, wells, castles and churches, they help create the rich diversity that makes Sandstone Trail country so interesting to walk through.